The motherboard supports DDR3 memory that features data transfer rates of 2200 (O.C.) / 1600 /1333 / 1066 MHz to meet the higher bandwidth requirements of the latest 3D graphics, multimedia, and Internet applications. The dual-channel DDR3 architecture enlarges the bandwidth of your system memory to boost system performance. Feel the adrenaline rush of real-time O.C. - now a reality with the ASUS TurboV. This easy O.C. tool allows you to overclock without exiting or rebooting the OS; and its user-friendly interface makes overclock with just a few clicks away. 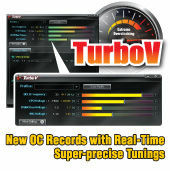 Moreover, the ASUS OC profiles in TurboV provides the best O.C. settings in different scenarios. Touch-n-Boost! ASUS Turbo Key allows the user to turn the PC power button into an overclocking button. After the easy setup, Turbo Key can boost performances without interrupting ongoing work or games - with just one touch! !